As a man in my mid-thirties I've never felt like I was quite the target market for Gilmore Girls but that hasn't stopped it from being one of my all-time favourite shows. When I first discovered the show in 2004, when it aired in the UK on Nickelodeon of all places, I found it enveloped me like a warm blanket with its small town setting and likeable characters. Like most fans of the show I wasn't pleased when the show's creator Amy Sherman-Palladino exited before the final season. 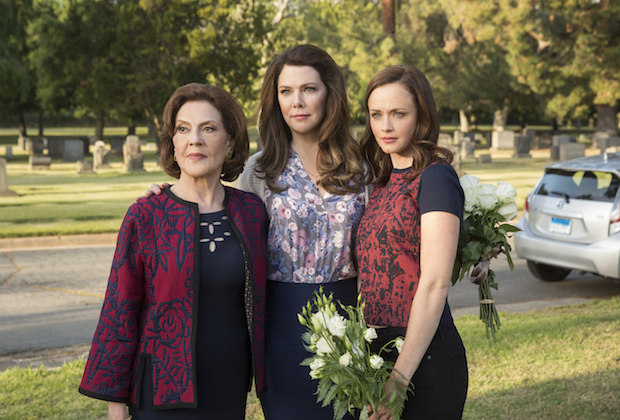 This meant that Gilmore Girls lost its unique voice and the final season saw all of the characters going through the motions rather than acting in a believable manner. Most importantly Sherman-Palladino never got to reveal the four words that were meant to be uttered in the show's final scene. Now, after nine years away, Gilmore Girls is back in the form of a four part Netflix miniseries and most importantly Sherman-Paladino is back at the helm. Subtitled A Year in the Life, each instalment of the Netflix series are roughly ninety minutes in length and represent a separate season. 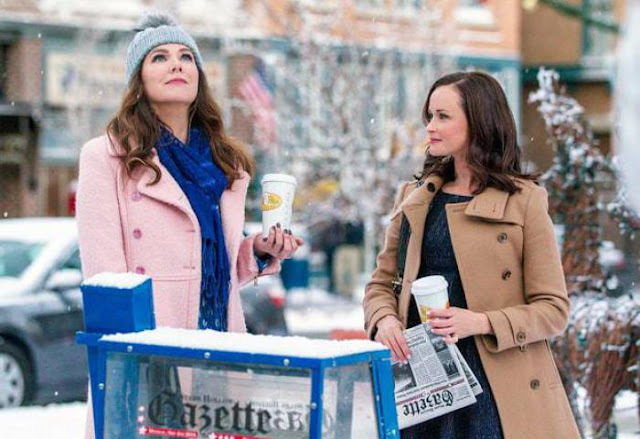 Beginning in winter, we return to the small Connecticut town of Stars Hollow alongside Rory (Alexis Bledel) who has popped back to visit her mother Lorelai (Lauren Graham). On the face of it Rory is still living the life of a successful journalist, having an article published in The New Yorker and being aggressively pursued by a youth-orientated website. However things are less rosy especially on the relationship front as Rory is dating the incredibly forgetful Paul whilst carrying on an affair with the engaged Logan (Matt Czuchry) any time she finds herself in London. Lorelai meanwhile is comfortable in her relationship with Luke (Scott Patterson) with the two seemingly having been together since Gilmore Girls ended the last time. However it seems that the two are still having communication issues especially when it comes to the topic of whether they want a baby. Lorelai is still at loggerheads with her mother Emily (Kelly Bishop) primarily after embarrassing her at her father Richard's funeral. Throughout A Year in the Life we see Emily struggle to adjust to life on her own as she tries to live life without the man she spent fifty years of her life with. Of these trio of tales I would say that I was most gripped by Rory's story arc primarily as I recognise elements of my own life in hers. The sort of malaise felt by someone in their thirties who is seemingly drifting in their work and personal life is a feeling I can identify with. The first half of the series sees Rory still clinging towards her journalistic dreams as she attempts to write an article for GQ about queuing as well the biography of Alex Kingston's loopy Naomi Shropshire. However it's the second half of the series that sees Rory truly drifting as she returns to Stars Hollow, despite claiming she's not back and tries to evade the rather brilliant thirtysomething club. Eventually she becomes editor of The Stars Hollow Gazette and angers the residents when she tries to mess with tradition by taking the traditional poem from the front page. But she finally realises her calling after a chance meeting with Jess (Milo Ventimiglia) she decides what she really needs to do is write the story about her and her mother that the rest of us have been following on screen. Rory's equally messy relationships also made sense from her comical partnership with the hapless Paul to her one night stand with a Wookie it appears the youngest Gilmore girls is drifting in her love life too. Despite his engagement to a French heiress, it appears that Rory can't help herself from returning to Logan and it was clear from the start that this self-destructive relationship couldn't end well. However the final episode saw Rory end things with Logan in rather a mature way and turned down his offer of a house in which to write her new opus. Before watching A Year in the Life I was most intrigued how the writing team would incorporate the death of Edward Herrmann into the drama. I think it was a good idea allowing us to grieve for both Richard and Herrmann through the characters who are all affected by his loss. Furthermore I liked that the only flashback we got was to Richard's funeral partly so we could all mourn his passing but also to explain the new animosity that exists between Lorelai and Emily. 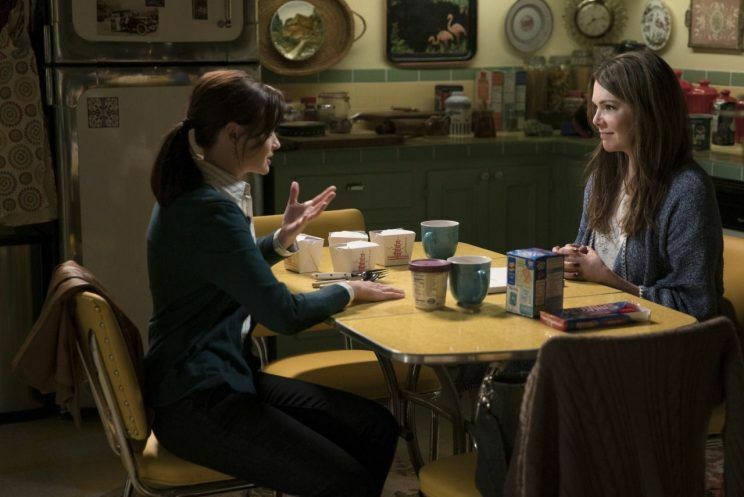 For her part in the story Emily tries to find herself in different ways including decluttering her life, attending therapy alongside Lorelai and even entering into a new romance with a longtime friend. However she is able to aide both Rory and Lorelai throughout the final episode both creatively and financially before she sells the iconic Gilmore house that has been one of the show's most famous locations. Lorelai's story seems to be the hardest to define as the character is seemingly searching for something in her life although she doesn't quite know what it is. In the first couple of episodes there's the suggestion that she and Luke will be having a child with the use of a surrogate. This storyline sees the return of Paris (Liza Weil) who now runs a surrogacy consultation firm and delights in showing Luke and Lorelai her collection of thoroughbreds. Lorelai also tries to work through some of her issues with Emily at therapy however she keeps attending sessions on her own. Finally she decides to follow in the footsteps of Reese Witherspoon and recreate the journey of Wild; the book not the film, but doesn't get very far. However a moment of clarity allows her to realise that what she really needs is to get married to Luke and therefore create an incredibly happy ending in the final scenes of 'Fall'. One of my favourite things about Gilmore Girls were the colourful inhabitants of Stars Hollow all of whom had their own defining personalities. A Year in the Life did well in recruiting almost every actor who has ever appeared in more than a handful of Gilmore Girls episodes to return for A Year in the Life. In my opinion I felt that Michel (Yanic Truesdale) got more to do here than he ever did in the seven years he appeared on the show as he felt like somewhat of an outsider. But it seems nine years of working alongside Lorelai has seen the pair become firm friends to the extent that the innkeeper is upset when Michel reveals he's leaving. We also learnt that Michel is now married to the unseen Frederick and in the process of starting his own family which means he needs more money or more responsibility that Lorelai can provide. Of the rest of the town's colourful characters I found that Kirk (Sean Gunn) was well-served by a number of comic storylines namely the creation of a new driving app known as ooo-ber and the addition of a new pet pig who was by his side for most of his time on screen. 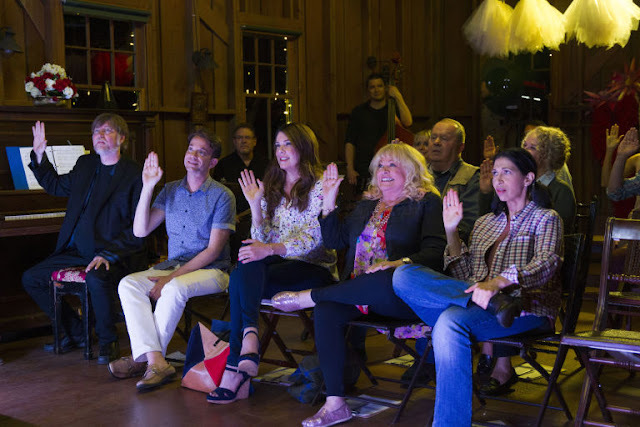 Additionally Taylor (Michael Winters) was on fine form especially in 'Summer' when he was behind the creation of Stars Hollow: The Musical; a show that basically ripped off ideas from successful Broadway hits such as Hamilton and Mamma Mia! However some of the character returns that we got throughout A Year in the Life felt less organic and more like a box-ticking exercise. For all the publicity about her finally agreeing to appear in the series I found Melissa McCarthy's cameo as Sookie to be underwhelming. Despite her star rising considerably since her Gilmore Girls stint I didn't feel that Sookie's reunion with Lorelai was particularly needed at that point in the story. Similarly pointless was the return of Rory's first boyfriend Dean (Jared Padalecki) who appeared in just one scene and added very little to the plot. Whilst I realise that bringing these characters back was to satisfy the fans I personally felt like some of them were shoehorned into the plot rather than feeling they needed to be part of the story. One of my worries about Gilmore Girls returning on Netflix was the creative freedom that showrunners appear to receive when producing content for the online platform. Thankfully for the most part Sherman-Palladino seems to have reigned things in with the majority of the scenes feeling like they could easily have been lifted out of an earlier season. The exception to this rule for me were the scenes in 'Fall' in which Rory was kidnapped by Logan's 'Life and Death Brigade' friends who then went on a trippy rampage throughout New England. Another sequence that felt like it went on a little too long was the aforementioned Stars Hollow musical although at least this produced some great comic moments. One thing I did notice was that Sherman-Palladino seemed to enjoy not tiptoeing round network rules and allowed her characters to use coarse language several times. I particularly enjoyed Emily's foul-mouthed exit at a DAR meeting after finally realising how useless the organisation was. After watching all four episodes over two days I can sort of understand why Sherman-Palladino wanted all of the instalments to be released separately rather than in one fell swoop. 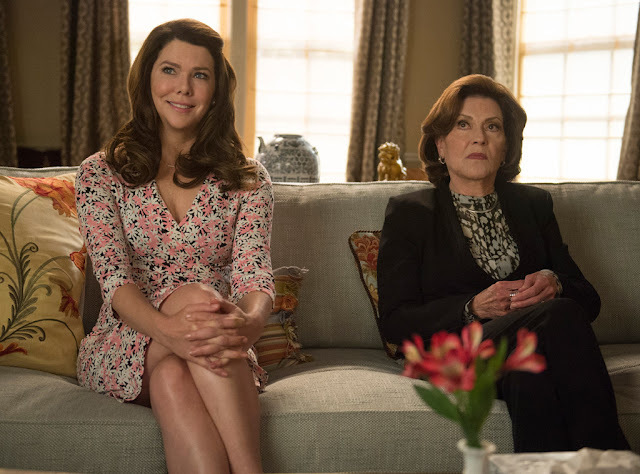 I don't think Gilmore Girls is a show that is particularly aided by the binge-watch structure and I could've possibly done with some breathing room between the conflicts set up between Rory and Lorelai in 'Summer' and their eventual reconciliation in 'Fall'. 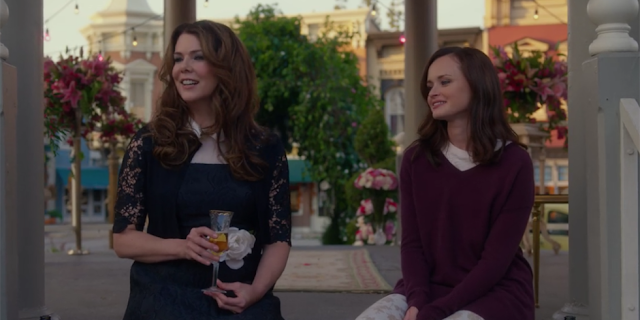 I was personally relieved that the writing style of Sherman-Palladino and her husband Daniel hasn't changed with all of the dialogue feeling as warm and witty as did in the glory days of Gilmore Girls. Although some don't like the frantic pace in which the characters converse with one another I really enjoy the quick-paced exchanges as it is one of the elements I most associate with Gilmore Girls. Another of these elements are the pop culture references which are as present here as they were in the show's original run and thankfully none of them felt particularly out of place. I personally appreciated the references to recent TV shows including the spate of Game of Thrones nods as well as a mention of Halt and Catch Fire which I found to be particularly amusing. As a reward for fans several of little in-jokes have been included in A Year in the Life including a sighting of Mr. Kim the father of Rory's best friend Lane (Keiko Agena) whose lack of presence during the show's original run didn't go unnoticed by fans. Similarly the fact that Luke seemed to have several diner assistants all named Caesar was brought up when Emily asked her future son-in-law if he had any more Ceasars. Another nod to real life was given when it was revealed that Paris' estranged husband Doyle was now a screenwriter which has to be a reference to actor Danny Strong's real life career change. Alongside the brilliant writing, the performances by the three lead actresses were all uniformly excellent with the trio still be absolutely believable in their roles. I felt that Lauren Graham was great at both handling the comic aspects of the show alongside the more emotional moments. Graham's facial expressions during the first run-through of Stars Hollow: The Musical were a particular joy as were her portrayal of Lorelai's attempts to sit through therapy sessions with Emily. 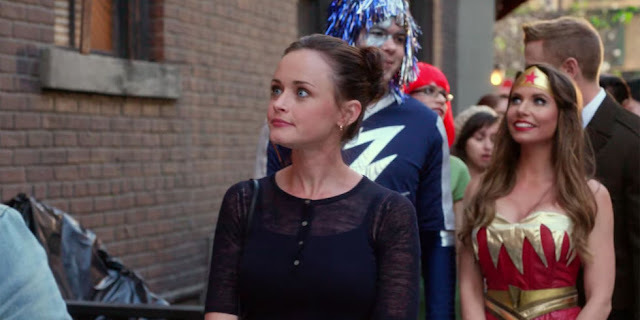 From the evidence here Alexis Bledel has definitely grown as a performer since Gilmore Girls ended as I found her performance as the drifting Rory to be particularly compelling. However it was Kelly Bishop who stole the show as she gave a realistic performance as a widow trying to decide what to do with her life next. Bishop especially excelled during Emily's explicit rant at the DAR and a subsequent scene at a Nantucket whaling museum. Of the supporting cast I found that Liza Weil gave a great turn as the ever-focused Paris whilst Sean Gunn was brilliant as ever as the eccentric Kirk. Praise must go to Rose Abdoo, who fans know best as mechanic Gypsy, who was completely unrecognisable as Emily's new maid Berta who slowly moved all of her family into the Gilmore home. So back to those final four words which essentially saw Rory reveal to her mother that she was pregnant and by doing so leaving the audience open-mouthed. 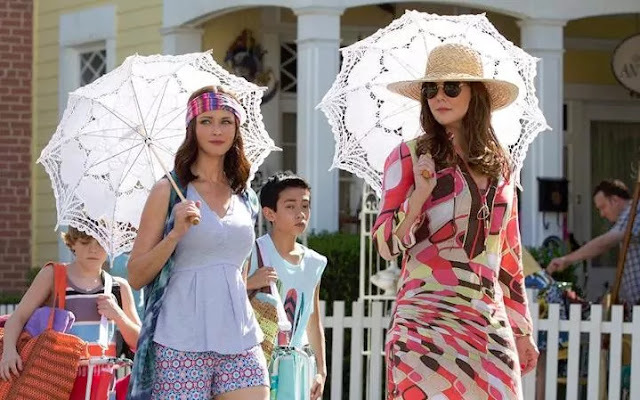 I'm still struggling to comprehend the fact that this was how Sherman-Palladino wanted to end the series the first time round as it doesn't give Gilmore Girls a finite ending. What it does do in my opinion is open up the option of another series where we see Rory coping with being a new mum and presumably a first-time author. Although Sherman-Palladino has already pretty much come out and said that reviving Gilmore Girls was something she needed to get out of her system I'm sure if A Year in the Life drew in plenty of viewers then Netflix would be keen to convince her to write another series. However if this is all we're getting then I for one am satisfied with A Year in the Life as it gave Emily, Lorelai and Rory believable storylines which all concluded nicely within the six hours. Although I could've done without some of the longer scenes, overall nothing felt like it had really changed with the dialogue and character both feeling fresh once again. More than anything else A Year in the Life reminded me why I was such as Gilmore Girls fan the first time round and why I'll continue to champion the show in whatever form it may take.